One theory suggests there’s a split timeline. On Monday, Sony and developer Naughty Dog released a long, brutal new trailer for the upcoming PlayStation 4 exclusive The Last of Us Part 2. Meant to spark interest in this post-apocalyptic sequel, the trailer stars an unfamiliar set of characters unleashing horrific acts of violence. The trailer certainly got people talking. It also got diehard fans theorizing about how these characters might connect to the original game. 1) Is the woman being hanged Ellie’s mom? At the start of the new trailer, two mysterious people wearing hoods drag a woman to a noose, put it around her neck, and force her to stand on a bucket. One of the aggressors says, “They are nested with sin.” She then pulls out a knife and holds it to the hostage’s stomach, possibly indicating she’s pregnant. According to this theory, the woman being hanged is Ellie’s mother Anna, who died shortly after Ellie was born. If true, that could mean one of two things: Either Ellie’s mom is still alive, or this is a flashback. The Godfather theory suggests that The Last of Us Part 2 takes place partially in the past. Here’s how the reasoning goes: The original The Last of Us ends with Joel telling a lie by saying the word “No.” The Godfather ends exactly the same way. By that rationale, it’s possible the creative team behind The Last of Us Part 2 will use the structure of The Godfather Part 2 as inspiration. Since The Godfather Part 2 has dual narratives—one following Michael in the present and the other following his father in the past—it’s possible the game will follow suit. Scenes starring Ellie will be set in the present, while scenes starring her mother will be set in the past. Ever since Naughty Dog began releasing concept art for The Last of Us Part 2, a number of fans have gone into detective mode, building a compelling case that the game is set in Seattle. 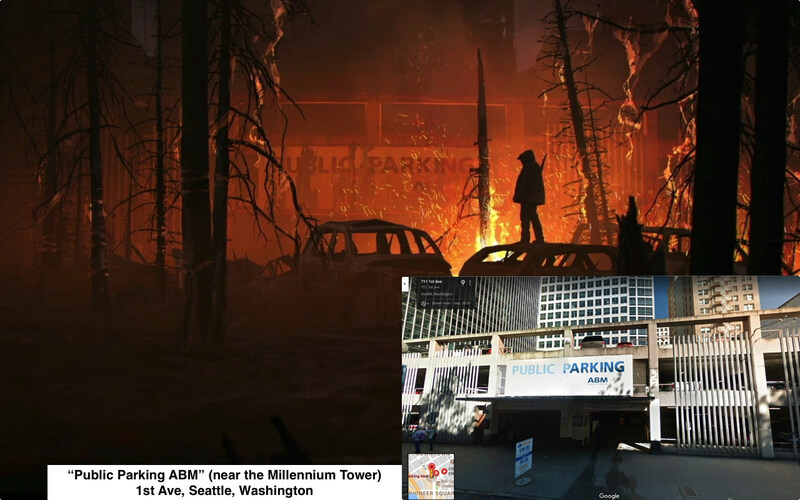 For one example, take a look at the concept art above next to a picture of a Seattle parking garage. You can find other comparisons in this Reddit thread. Those images certainly make a compelling case. But the original The Last of Us took place across a number of settings as the heroes travelled across the U.S. It’s possible Seattle is just one of many settings for the sequel. 4) Is woman being hanged Ellie’s girlfriend? In The Last of Us: Left Behind DLC for the original game, there’s a scene in which Ellie and her female friend Riley kiss, indicating Ellie is lesbian or bisexual. According to this theory, in the five years that elapse between the games, Ellie has a girlfriend and settled down in a town run by a religious cult. When the cult finds out Ellie and her girlfriend are romantically involved, the cult turns against them. If that’s true, it’s possible the woman being hanged is Ellie’s girlfriend, which could make Ellie the “other apostate” the aggressor mentions. It’s not just this trailer that has sparked fan theories. After the first trailer came out, fans speculated Ellie might be pregnant, and Joel might be dead. Unfortunately, we won’t have the answers until The Last of Us Part 2 comes out. With no release date announced, we could be waiting for a while.